One of the more well known nutrient interactions is that taking vitamin C with iron increases the uptake of iron into the body. Up till I wrote that last sentence I had never thought to question this, nor understand biochemically why this is. However given it is widely known for the time being we will assume it is true. Was in at Zespri- the kiwifruit people - last week.While waiting in read their monthly newpaper/newsletter. 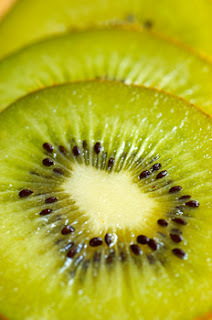 On the front page is the title "Women with low iron stores benefit from Zespri Gold kiwifruit." I immediately thought of kiwifruit being high in vitamin C and this increasing the iron uptake. Buried in the article is exactly this. This indicates to me that food that had high vitamin C, is going to increase iron absorption. Therefore this shows it is not just occurring in vitamin / multi mineral supplements. I found a great vitamin C that I would highly recommend. It is called Isotonix Vitamin C and it is highly absorbable.